For a long time, the Jeep Grand Cherokee has defined the midsize SUV segment. Coincidentally, the Grand Cherokee is also the most awarded SUV on the market, and those awards and accolades keep on coming. This year alone, the 2015 Jeep Grand Cherokee has over ten awards under its belt, and that is only the beginning. Maybe you have read about how incredibly impressive the 2015 Jeep Grand Cherokee is. Maybe after reading those impressive statistics, awards, and numbers, you are considering joining in on the fun, with your own Grand Cherokee lease. Whether it was the Crossover of the Year, Best Value On-Road, SUV of the Year, or the Best American-Made SUV of 2015 award, that had you convinced – it doesn’t really matter. You have decided to embark on the great journey of driving the best SUV on the market. Now that you have made that decision, it is important to know the ins and outs of the greatest SUV ever made. There is a lot to know about the 2015 Jeep Grand Cherokee. There are a lot of trim levels, special edition models, and packages to choose from. Simply pointing at a Grand Cherokee and claiming it, will not suffice. You need to drive a Grand Cherokee that suits you, your lifestyle, and your personality. We have taken the liberty to compile a list of the 2015 Jeep Grand Cherokee models, along with the different things they offer, all in an effort to help you make an informed decision (and also because we really love the 2015 Grand Cherokee). With all of that aside, check out the options for your 2015 Grand Cherokee lease. Let’s start with the basics. The 2015 Jeep Grand Cherokee is available to purchase in eight different trim levels. Each model represents a different level of amenities, features, and price. Just like all Jeep vehicles, each Grand Cherokee comes equipped to hit the trails, but some of the models will perform better than others. Check out the eight trim levels below, which are listed in order from least expensive, to most expensive. Now that you have the names in mind, let’s dive a little deeper into each model offering, and see what each one costs. The base 4×2 versions of the Grand Cherokee are the least expensive, but for our purposes, we will list the starting MSRP of the 4×4 versions of each model. Laredo – With a starting MSRP of $31,995, this base model is the most affordable in the Grand Cherokee lineup. This version comes standard with a 3.6-liter Pentastar V6 engine, and is paired with an 8-speed paddle-shift automatic transmission. Drivers can head off-road with the Quadra-Trac I 4WD system that also comes standard on this base trim level. Interior – Featuring 60/40 split rear folding seats, cloth interior, and a front-passenger fold flat seat, the Laredo is both basic and accommodating. A 12-volt auxiliary power outlet is featured in both the front and rear of the SUV. A dual-zone automatic temperature control system, a leather-wrapped shift knob, steering-wheel mounted shift levers, and a rearview mirror with microphone all come standard. Technology – A 5-inch touchscreen display, a 7-inch LCD instrument cluster, and Bluetooth are all standard on this base model. Exterior – 12-inch aluminum wheels come standard, along with off-road tires and a tire pressure monitoring display. Laredo E – The 4×4 version of this model starts at $33,995, and features many of the same standard features as the base Laredo, including the same engine and transmission. This Grand Cherokee model adds a power driver seat, SiriusXM Satellite Radio, and chrome roof rails. Altitude – Starting at $38,895, this next-level up builds off of the Lardo E and offers many of the same standard amenities. Drivers will appreciate upgraded black leather seats with a suede insert, heated and power front seats, and distinct exterior trim. Another upgrade on the Altitude is standard 20-inch gloss black wheels, and standard security and convenience features. Limited – This Grand Cherokee model is one of the most popular trim levels available. Starting at $39,065, the Limited offers the Quadra-Trac II 4WD System, and plenty of added amenities that are missing in lower-end models. Remote start comes standard, as well as leather seating throughout the cabin. Both the driver and passenger seats feature memory options, while the rear seats gain heat. A rearview camera, rear parking sensors, and an upgraded premium audio system are also all standard. Overland – This next trim level takes a major price hike, with a starting MSRP of $46,595. Still standard is the 3.6-liter V6 engine and 8-speed automatic transmission. Drivers who appreciate luxury will be happy with the Luxury Group II package that comes standard. Some of the luxury features include ventilated front seats, panoramic sunroof, rain sensitive automatic windshield wipers, Bi-Xenon HID headlamps, a 8.4-inch touchscreen display, and navigation. Summit – This luxurious SUV is one of the Grand Cherokee’s highest-end trim levels. Starting at $51,995, the Summit comes standard with a towing package, active noise control system, illuminated sill plates, and the advanced technology group package. SRT – The true top of the line Grand Cherokee starts just shy of $65,000, and comes equipped with everything you could want, need, or imagine. This powerhouse Grand Cherokee comes standard with a 6.4-liter HEMI V8 engine, and a special 8-speed Paddle-Shift automatic transmission. This model is also the only Grand Cherokee that comes standard with Jeep’s Quadra-Trac Active On Demand 4WD, and a 180-MPH primary speedometer. Brembo brakes, an adaptive suspension specially tuned steering, performance tires, and sport seats, all come standard and round out the SRT’s high-performance package. After all of that information, all of those names, numbers, and details – we have boiled it down for you in a simple message. If you are the average American, looking for a bit of luxury and the option for high-end appointments, the 2015 Grand Cherokee Limited seems to be the ticket. The Limited offers the best of both worlds in terms of standard features, and optional upgrades. 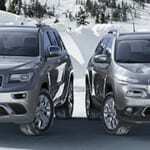 Drivers who choose the Grand Cherokee Limited will be able to upgrade quite a bit of equipment and technology features, that lesser models aren’t offering. The Laredo is a great choice for those on a budget, who also want some convenience features like Bluetooth and keyless ignition. For the price, you really can’t beat the Limited. The 2015 Grand Cherokee SRT is the mack-daddy when it comes to the Grand Cherokee. Skip this one if you don’t need all of the high-performance extras. If you do need or more importantly, want all of the high performance specs, and your budget is on the higher end, than the SRT is the perfect choice. The best part of a Jeep Grand Cherokee lease, is that there is a model to suit every lifestyle and budget. Drivers across the board on both accounts are able to find the perfect solution to their transportation woes, and their adventurous inklings. Bottom line is – driving your very own Jeep Grand Cherokee is an easy choice to make. Choosing which one you will drive? Well, that’s a decision we will leave up to you.